Light Up LED Speaker - You can enjoy the LED light show when you listen, There are 6 patterns of LED light When People dances with sound along with the sound.It applies to video, games, gatherings, parties, bars. Long Play Time:Built-in high capacity battery,support for music playback 3-5 hours (determined by volume and audio content) . High quality bluetooth speaker with DSP that adds power to music. A compact body can not be imagined, realizing a dull sound. You can feel relaxed and low-pitched bass from a remote place. 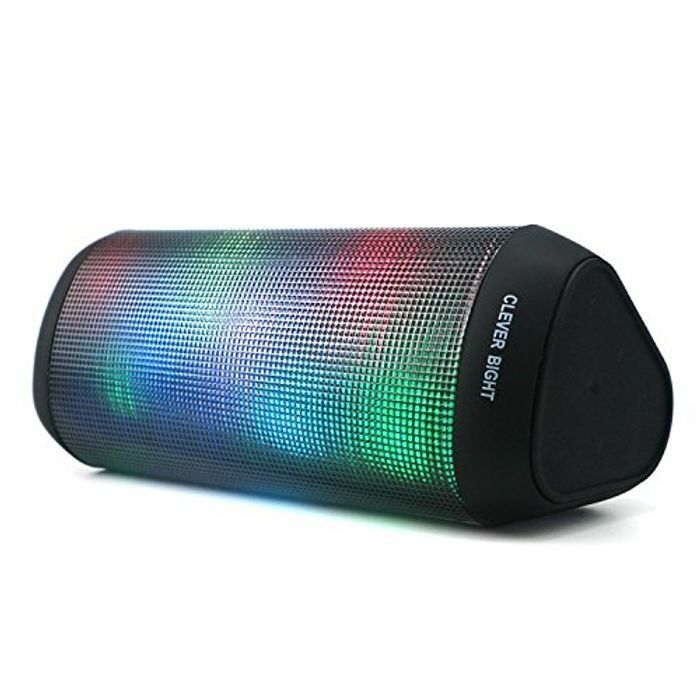 Easy Connection and Control: Bluetooth speaker makes it easy to control the mood and energy of any party by giving you fingertip control of the tracks you're playing, their volume and more, easy connection to your wireless devices: any device, Smart-phone, mobile, and cell phone that have Bluetooth. Also devices including: tablets, laptop, desk computer, smartphone and all bluetooth compatible. There is no limit you can go wireless or plug into any boom box with 3.5mm jack cable.